Aiki-Doh!-ka is the personification of the earnest yet somewhat whimsical, and occasionally flawed aspiration that imbues all Aikidoka. You might say he is the Don Quixote of Aikido – he has the best intentions, but is somewhat lacking in his execution. 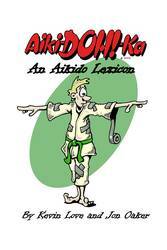 After years of careful observation and countless interviews with Aiki-Doh!-ka, Kevin and Jon have compiled this zany compilation of humorous definitions to common (and not so common) Aikido terms. Jon and Kevin practice Yoshinkan Aikido at the Aiki Budo Centre in London, Ontario (Canada). Jon currently holds the rank of Ni Dan and Kevin is in the 1st Kyu. They take Aikido seriously and train hard, but always remember to laugh, too. This book is dedicated to the spirit of Aiki-Doh!-ka, who lives in us all.